Getting your Windows machine ready for OpenCL is rather straightforward. In short, you only need the latest drivers for your OpenCL device(s) and you're ready to go. Of course, you will need to add an OpenCL SDK in case you want to develop OpenCL applications but that's equally easy. The steps described herein have been tested on Windows 8.1 only, but should also apply for Windows 7 and Windows 8. We will not discuss how to write an actual OpenCL program or kernel, but focus on how to get everything installed and ready for OpenCL on a Windows machine. This is because writing efficient OpenCL kernels is almost entirely OS independent. If you want to know more about OpenCL and you are looking for simple examples to get started, check the Tutorials section on this webpage. If you only need to run an OpenCL application without getting into development stuff then most probably everything already works. Check that you have a device that supports OpenCL. All graphics cards and CPUs from 2011 and later support OpenCL. If your computer is from 2010 or before, check this page. 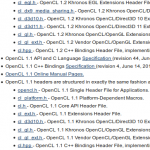 You can also find a list with OpenCL conformant products on Khronos webpage. Make sure your OpenCL device driver is up to date, especially if you're not using the latest and greatest hardware. With certain older devices OpenCL support wasn't initially included in the drivers. Intel has hidden them a bit, but you can find them here with support for OpenCL 2.0. AMD's GPU-drivers include the OpenCL-drivers for CPUs, APUs and GPUs, version 2.0. NVIDIA's GPU-drivers mention mostly CUDA, but the drivers for OpenCL 1.1 1.2 are there too. In addition, it is always a good idea to check for any other special requirements that the OpenCL application may have. Look for device type and OpenCL version in particular. For example, the application may run only on OpenCL CPUs, or conversely, on OpenCL GPUs. Or it may require a certain OpenCL version that your device does not support. A great tool that will allow you to retrieve the details for the OpenCL devices in your system is Caps Viewer. Now it's time to put the pedal to the metal and start developing some proper OpenCL applications. Make sure you have a machine which supports OpenCL, as described above. Get the OpenCL headers and libraries included in the OpenCL SDK from your favourite vendor. Start writing OpenCL code. That's the difficult part. Tell the compiler where the OpenCL headers are located. Tell the linker where to find the OpenCL .lib files. Run and prepare to be awed in amazement. Ok, so let's have a look into each of these. 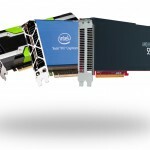 NVIDIA – CUDA Toolkit. 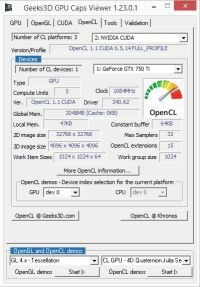 You can grab the OpenCL samples here. 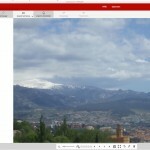 AMD – AMD APP SDK. Also works with Intel's CPUs. Intel – the previous Intel SDK for OpenCL is now integrated into Intel's new tools, such as Intel INDE (which has a free starters edition) or Intel Media Server Studio. Grab any of these in order to have everything ready for building OpenCL code. As long as you pay attention to the OpenCL version and the OpenCL features supported by your device, you can use the OpenCL headers and libraries from any of these three vendors. If you're using the AMD SDK, you need to replace "$(CUDA_INC_PATH)" with "$(AMDAPPSDKROOT)/include" or, for Intel SDK, with "$(INTELOCLSDKROOT)/include". As in the case of the includes, If you're using the AMD SDK, replace "$(CUDA_LIB_PATH)" with "$(AMDAPPSDKROOT)/lib/x86_64" , or in the case of Intel with "$(INTELOCLSDKROOT)/lib/x64". And you're good to go! The application should now build and run. Now, just how difficult was it? 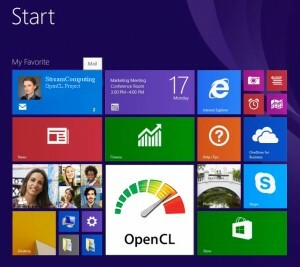 Happy OpenCL-coding on Windows! If you have any question or suggestion, just leave a comment. OpenCL basics: Multiple OpenCL devices with the ICD. Anca Hamuraru joined StreamComputing in 2014, a collective of performance engineering experts.